FREE for a limited time – Animal Pre-K Learning Games for Kids with Skills on the Farm, a cute educational app for preschoolers. 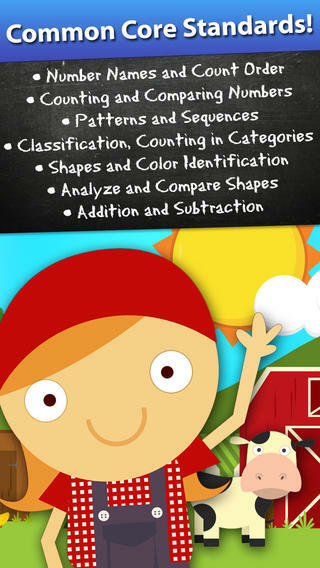 Lily the farmer leads kids through a series of games that teach preschool/K skills: colors, shapes, counting 1 – 10, groups & categories, sequencing & patterns, addition & subtraction. I like that the app teaches shapes in two ways – a circle and a donut, an oval and a watermelon, a rectangle and a bus, etc. And, I was particularly impressed that it names a kite shape as a rhombus. As kids play, they help the cute farm animals (Pinkie the pig, Oliver the horse, Bessie the cow, Cordelia the chicken, Gordon the goat, Sherman the sheep, Webster the duck, Pete the frog) find their way back home. The app is bright, colorful and full of positive encouragement. Nicely done, this app is sure to appeal to little ones.